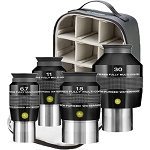 Explore Scientific's 68°-Series Wide-Angle Eyepiece Set includes 16mm, 24mm, and 34mm wide-field telescope eyepieces designed for planetary and deep-space observations and a carrying case for them. 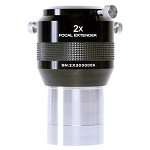 Using these 68° field of view eyepieces makes objects easier to locate, and when using non-driven telescopes the object will stay in the field of view longer than conventional eyepieces, requiring fewer adjustments. 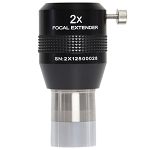 The 16mm and 24mm eyepieces have the common 1.25" barrel diameter, while the 34mm comes in a 2" barrel for use in larger focusers. 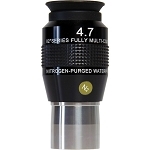 Low dispersion and high refractive index optical glass, coupled with anti-reflective fully multicoated optics ensures bright, high-contrast images with true color transmission across the entire field of view. 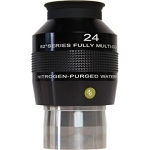 Contrast is further enhanced through the use of fold-down rubber eyecups that prevent stray light from leaking into your eye, and their long eye relief makes these eyepieces ideal for comfortable viewing for extended periods. 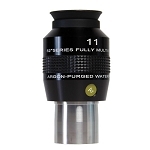 Each eyepiece features a textured surface for a sure-grip when changing it out and argon-filled housings for water and fogproof performance when used in extreme temperatures and climates. 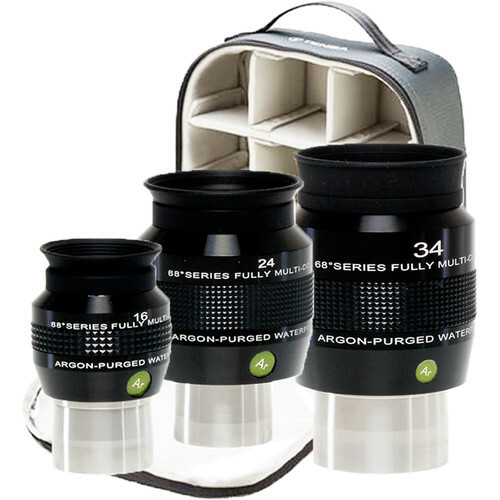 This set is intended to provide medium magnifications on most telescopes, and comes with a convenient soft-sided carrying case that has removable and easy-to-customize internal dividers, a zipper closure and carrying handle.